King David’s famous psalm praises the Lord for His creation and His sovereignty over it. God created an interdependent planet in which species depend on other organisms for life. Humans are no exception; our health is linked to the health of natural resources. Nowhere is this interdependence more evident than in rural com-munities where people survive off what they can grow. Though these communities remain some of the poorest on earth, they are at the forefront of restoring the earth’s natural resources. More than 30 years ago Tom Woodard, Plant With Purpose’s founder, asked an inspired question: what if planting trees was a solution to rural poverty, a solution that would provide jobs, improve food security, and restore the land? Since the first trees were planted in the Dominican Republic, farmers partnering with Plant With Purpose have planted 23,060,534 trees across seven country programs. Tiny seeds have grown to form Plant With Purpose’s holistic three-part development approach, with environmental restoration as a pillar. As global environmental conditions worsen and reports of droughts, floods, famine, and climate change increase, over 35,000 Plant With Purpose partnering families are doing their part to make a positive impact and heal the land. Taking David’s psalm to heart, farmers in Tanzania have set out to change the trajectory of their surroundings, including the iconic Mt. Kilimanjaro. In 2012, Plant With Purpose Tanzania developed a group competition to inspire further good work from program participants. As the competition evolves each year in scope, so does its impact. Initially groups competed to plant the most trees. The following year groups worked to heal local water sources through reforestation. In 2014, the competition encouraged farmers to use organic, sustainable methods that would add to the soil instead of stripping it of nutrients. Thanks to the group competition, partnering farmers now plant an average of 400 trees a year. With limited acreage—average property size is 3.3 acres according to the 2014 Impact Evaluations—personal farms quickly become saturated with veg-etation. Participants in the annual competition have extended their impact to reforesting Tanzania’s sloped riverbeds. These steep ravines are typically public property and as groups have discovered, they’re a great place to plant trees. Farmers whose properties include water sources are also reforesting river ravines. On Lucas and Paslida Tarimu’s farm you can find avocado, corn, coffee, lettuce and tomatoes. Yet the most dramatic improvement to their farm did not come from the variety of crops but rather the 2,000 trees planted along the steep slope of their property. Many of these trees are now more than thirty feet tall. Last year’s group competition emphasized organic farming methods and it was only fitting that the competition commenced with an organic agriculture festival. More than 3,000 people attended and farmers from across the Kilimanjaro region contributed their organic vegetables to the rich display of local produce. Plant With Purpose partnering farmers cultivate plots that integrate beneficial plants, increasing crop yields and improving pest management. Agroforestry training encourages the integration of planting trees, raising livestock, and growing vegetables in biointensive double dug gardens. As partnering farmers learn to make both compost and organic pesticides from resources on hand, their health and the health of their farms increases. Partnering farmers are cultivating bananas, vegetables, coffee, sweet potatoes, and cassava at a higher rate than comparison households. In fact, their crops are 42 percent more diverse than those of nonparticipants. This crop diversity, along with organic farming methods, heals the land they depend on for survival. By cultivating healthy and organic family farms, they are restoring natural resources like soil and inspiring neighboring communities to do the same. 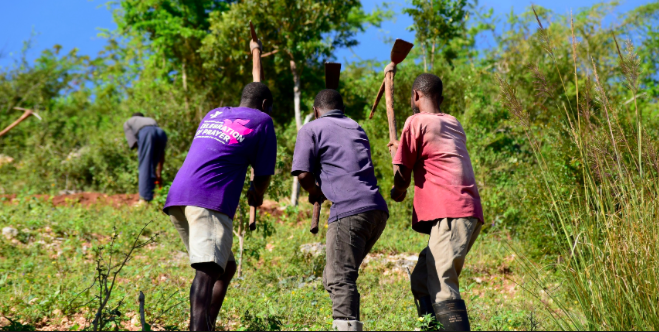 As farming families restore Tanzania’s natural resources, positive stories abound. Stories of birds returning to the area speak of increasing biodiversity. Stabilized mi-croclimates are more conducive for plant growth. Trees planted in ravines allow wa-ter to soak into the soil and refresh streams. PlantWithPurpose.org the leading the Christian movement for poverty alleviation via environmental restoration, spiritual community, and economic empowerment. Learn more about their work in Tanzania here. Visit their website to get involved!